Mad Magazine Cartoonist Jack Davis Dies At 91 : The Two-Way Money from a job illustrating a Coca-Cola training manual became a springboard for him to move from Georgia to New York. 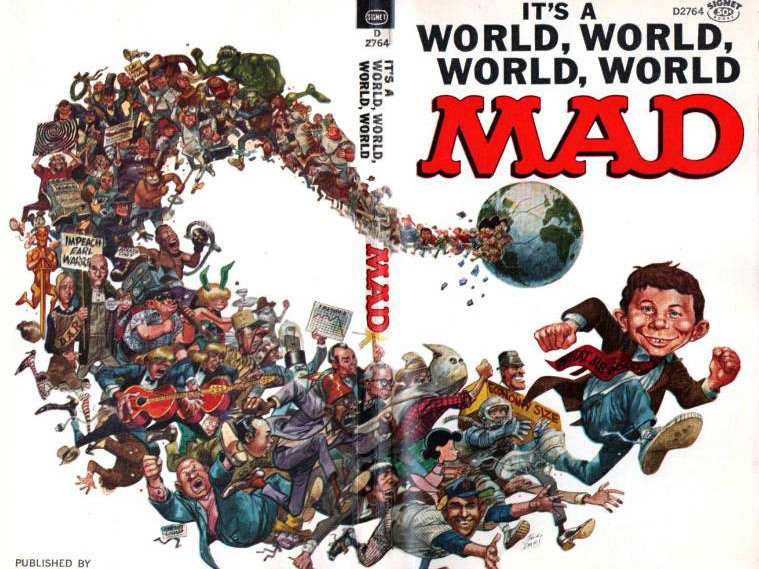 A cover for Mad magazine by artist Jack Davis. His art appeared in a range of places, from the Navy News and Tales from the Crypt to Time and TV Guide. Jack Davis, a founding member of Mad magazine, has died at 91. The influential cartoonist was one of the humorists known as the "Usual Gang of Idiots." Davis' knack for dry caricature created iconic parodies for Mad, spoofing TV and films from High Noon to Raiders of the Lost Ark, Gone with the Wind and M*A*S*H.
"More than any one piece, it was Jack's immediately recognizable style that revolutionized comic illustration," said MAD art director Sam Viviano. "There is not a humorous illustrator in the past 50 years who hasn't been influenced by him." Davis was a native of Atlanta who served in the Navy and attended the University of Georgia before heading to New York City. As an obituary at WGAU Radio in Athens, Ga., relates, he used the money he made from a job illustrating a Coca-Cola training manual as a springboard to launch his career in New York. After helping launch Mad in 1951, Davis contributed to the magazine often; he also created more than 20 covers for TV Guide. "Davis was particularly noted for his depiction of the Crypt-Keeper in the horror comics, revamping the character's appearance from the more simplistic Al Feldstein version to a tougher, craggier, mangier man with hairy warts, salivating mouth and oversized hands and feet, who usually didn't wear shoes." While he was at the University of Georgia, Davis had studied with artist Lamar Dodd, for whom the art school is now named. He was a loyal follower of the school's Bulldogs, producing a string of sports caricatures and illustrations over the decades — as the school notes, many of his drawings included "a bulldog usually pummeling opposing team mascots and/or celebrating." Mad editor John Ficarra says, "Jack will always be remembered for his charming modesty and Southern gentleman manner — which completely belied his rascally sense of humor and wry wit." 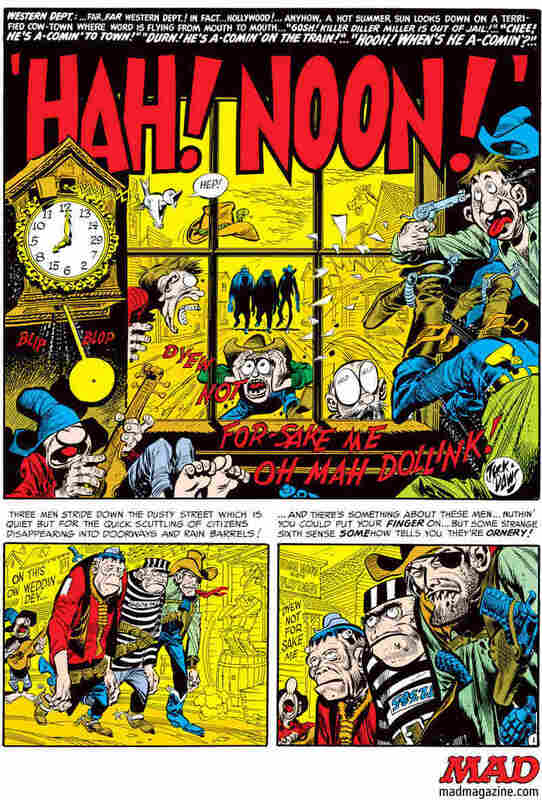 Jack Davis created this parody of High Noon for Mad magazine; Davis, a founding cartoonist for Mad, has died at age 91.